Which cut flowers last the longest, and how can you prevent cut flowers wilting and fading? If you’re looking for cut flowers that keep the longest, along with some tips and tricks for how to get the best out of your blooms, read on. The three most popular cut flowers in the United States for the last several years have been roses, carnations and chrysanthemums. How do these favorites fare for longevity? Fresh roses have a vase life of 7 to 10 days, if you keep them in cool water. Here’s a tip if you need them to bloom open in time for an occasion: if you buy them from a florist, gently squeeze the bud. If there’s lots of give, don’t buy it. You want firm, tight buds. If you need to have them bloom quickly, put them in slightly warmed water when you get them home. Carnations can last for between two and three weeks. Remove foliage below the water level, and keep what foliage remains out of direct sunlight. 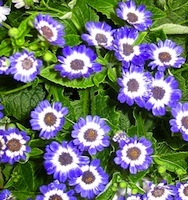 To encourage them to last a little longer, you can ruffle your fingers through the petals. Chrysanthemums can last as long as a month, but you have to keep the water clean (they’re quite susceptible to water-borne bacteria, while will have them fade and wilt pretty quickly if you’re not on top of it.) Some find that gently scraping the bottom inch or two of the stem helps with water uptake, helping to keep the blooms fresher. Orchids are long-lasting, as long as you follow the usual basic care for all cut flowers (every day or two, trim the stems and change the water). You should expect about three weeks life for a fresh orchid. The gladiolas has a vase life of about two weeks, which you can extend a little by thinning out the fading blooms. Another popular flower with a good life span is the lily, which has a vase life of about two weeks. You can extend this if you remove the pollen as the blooms open – this also prevents staining. As the first set of lily blooms fade and brown, pinch them off to encourage the second set to blossom. You can read our other flower keeping tips which will help you take care of your cut flowers, ensuring that you get enjoyment for the maximum duration, with only minimal effort.